My Thoughts, Views, Tips and Commentary on Technology, Politcs and Health. Let’s get backing up this New Year! So another year is gone and a new one is upon us. Many of us have received or purchased new computer systems for personal use, work or school or will be soon. Nowadays many of us have a great deal of our lives – pictures of family, personal and legal documents and more stored digitally on our computers. And many do not have any backups of said systems. I continually preach the benefits of using system images for backing up your computers. With imaging you can restore entire systems in case of hard disk failure, restore individual files and folders, upgrade/migrate to newer larger and faster HDDs (usually SSDs) and even move to completely new systems. One of the first things everyone should know is that your digital system(s) WILL fail. And can at anytime. And if you have no recoverable backup your data will be gone forever. Please don’t let this happen to you. One thing I do – because I am such a stickler on having my own stuff backed up, is have TWO full backups on SEPARATE disk drives. This allows for me to keep the two seperate full images in two different locations. And should one backup drive fail, I have another to go to. The likely hood that both would fail (along with my primary system) is remote and if I had that triple whammy I’d have to assume God needed me to lose it all. External Hard Disk Drives can be had very inexpensively. For example here is a good deal on one from Amazon. And the cost of imaging software is under $100.00 US (often way less too). A VERY small price to pay for peace of mind and the security of knowing you’ll be able to recover your important files, pictures and entire system. Here is a previous article I’ve written. All points valid still. Acronis – Acronis works on Mac and PC. I prefer the 1-time purchase option because I like to OWN my stuff and not ‘rent’ it. Check that out here. They have loads of tutorials in their knowledge base. For Mac only there is Carbon Copy Cloner (CCC), my favorite. Or another good alternative SuperDuper. Of course on Macs, you can use Apples built in Disk Utility to create an image but it is more onerous. And you can’t really make incremental backups. You can of course, create an image and use TimeMachine backups to make up the difference I guess. As a free alternative for Windows 8.1 and 10 there is the built in backup utility which includes and imaging option. However I’ve had issues restoring images to differing hardware. Here is a very good article on how to do that. Another very good option for PC is Macrium Reflect. They even have a free version (here) that works very well. I’ve used the latest version successfully a few times. One more way I use to augment my backups is with the "Cloud". Cloud storage sounds very nebulous, but is really just utilizing large storage pools made available by numerous internet service providers to augment their offerings and services. Cloud storage is GREAT for storing a large amount of ‘nonproprietary’ information; things like most pictures many documents and files etc. I just make sure to not put up to the cloud any critical/personal/financial documents or other highly private information. I pay a little extra to Google to have loads of extra Google drive space that I upload many pics and files to. [and of course Google provides for free unlimited photo storage with some gotchas on the having to do with photo size and quality]. I have Microsoft’s One Drive that came with my purchases of Microsoft Office and some Windows 10 devices; but that storage size has been cut down recently. With my Amazon Prime account I also have unlimited picture storage too. And I also even have Dropbox. So for plain mundane data storage you can see I use many of the available options in the cloud. But the ‘cloud’ does NOT enable you to recover your entire system should the drive or other major component fail. Or worse – burn up in a fire or get damaged by some other catastrophe. So no matter what I store in the cloud I ALWAYS have copies on my own personal systems somewhere. I may be a more than a little "tight" about keeping data. But decades of dealing with data losses in the corporate and personal world has made me so. I hope that some of you take some time in this New Year to do some digital safe guarding. Like a fire extinguisher you need to have it on hand and ready before you have the fire. Author adminPosted on January 8, 2017 October 19, 2017 Categories Acronis, Amazon Prime, back up, Carbon Copy Cloner, Dropbox, Google, Mac, OSX, Security, Windows, Windows 10Leave a comment on Let’s get backing up this New Year! 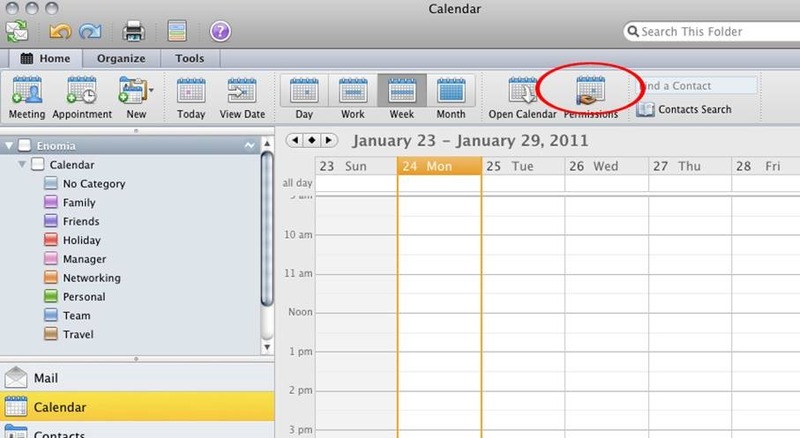 1.Select your calendar, and then choose “Permissions"
To activate the greyed "Permissions" Icon, just click the name of your calendar on the left bar under "My Calendars". When "My Calendars" is selected, Permissions may greyed out. 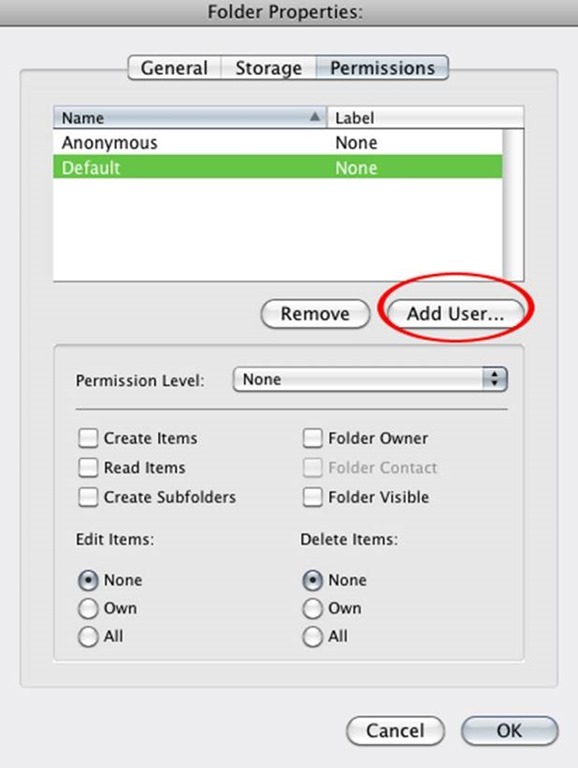 When the name of Calendar individually is selected, Permissions should now be made available. I recently wrote about the major security whole in the latest version of OS X – read my last post. It appears Apple has released the fix finally. Although the ‘fix’ comes not in a simple ‘patch’ but in an entire Operating System upgrade! After several months of testing, Apple has released OS X version 10.9.2. The MAJOR (and very dangerous) SSL bug isn’t mentioned in the release notes that appear in Software Update, but the bug is mentioned on Apple’s security page for the update. Seems Apple is being their usual shity selves when it comes to security – hide or lie about it, sort of hiding the fact that this is so important. To be a ‘little’ fair, this update does add some features but over all is really a bug fix of many major issues with the new Operating System. In Windows terms it would be called a full Service Pack. As with any large Operating System upgrade/update you should of course back up your system – Use Time Machine or any other method I’ve described in previous posts. Run the Software Update to update your system to 10.9.2 and if any other software shows updates available, select them too. If you’d like you can grab the full Combo update here. If you have Mountain Lion it too has an update available – run Software Update to get it. Please make sure if you run an Apple desktop or laptop computer that you update as soon as possible. It had been know for MONTHS that there was a serious security flaw in iOS and possibly the latest version of OS X that could allow attackers to surreptitiously circumvent the most prevalent Internet security protocol – TLS/SSL and and Security Certificate validations. The issue is a “fundamental bug in Apple’s SSL implementation,” This can allow attackers to view ANY of your ‘secure’ Web communications. This includes e-mail, banking sites. Facebook etc..
Apple finally released an ‘emergency patch’ to the latest version of iOS last week, but it appears that the flaw affects more than just Apple’s mobile platforms. It actually affects the latest versions of OS X – Apples latest desktop Operating System too!! If you use the Desktop Apple Operating System – OS X you should always use the latest versions of Chrome or Firefox for internet browsing to help mitigate some of the possible exposure. [I NEVER use Safari and always recommend to all my clients that they don’t either]. Even if you’ve take the latest update on your iDevice I’d still recommend I’d recommend Chrome for iOS. Here one of the latest articles I’ve found with a VERY good explanation. You should at least read this! But I’d recommend hitting all my sources. Looks like Oracle has quickly released a patch to the serious Java security whole. But it also looks like they ‘poorly packaged’ it. So it may not install correctly on all Operating Systems. First, verify you have the latest version of Java installed; go here. If not, then get the latest version here. This can be fixed by first ‘trying’ to uninstall all the Java applications you find. Go to Control Panel>Programs and Features>Java.. then pressing uninstall for each Java application listed. If that fails (and it has for me on two Windows systems) Grab Microsoft’s Uninstall Utility here, run it and choose ‘having problems uninstalling..’ and let it do it’s thing. You’ll be presented with a window showing what applications you wish to remove; choose Java 7 or what ever was giving the error. Another Flashback Variant – 2nd in two days! Hey Mac users who still haven’t taken the hint and update your systems’ security there’s yet another version of the Flashback Trojan for you to enjoy. It infects unprotected Macs in the same way Flashback.K did, through a Java applet exploit, and installs itself without the need of your password. And, just as its predecessor, Flashback.K erases its footprints by deleting the Java cache and ensures its propagation by installing into the Java Update folder. You can read more here. Apple released a Java patch in early April, as well as a Flashback removal tool, but clearly not all Mac users patched. But many Mac users don’t even qualify for the patch—it was only available to systems running OS X 10.6 (from 2009) and later. Mac users running OS X v.10.5 and earlier were advised to disable Java altogether. WTF!! However, it’s quite possible that many users of these older systems just didn’t get the memo and are still running insecure software. Here is F-Secure’s site that has the checker and removal tool. Check that out too. And please update your systems folks. 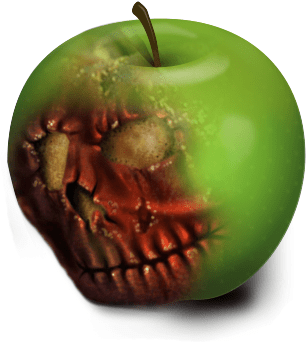 Author adminPosted on April 25, 2012 April 14, 2013 Categories Apple, Mac, OSX, Security, tech tips, Trojan, virusLeave a comment on Another Flashback Variant – 2nd in two days! So it’s spring time woodchuckers. Time for some cleaning and maintenance for many around that house. It’s also a good time to check your backup plans and procedures for your digital data too. Or if you don’t have any make and apply some sort of plan. You know those stupid commercials about not knowing when you will lose your data. Well, THEY’RE TRUE! It is not a matter of ‘IF’ but WHEN. There are many factors and events that can cause a loss of your important data: Things such as fire, flood, earthquake and other natural disasters. Power surges or outages. Theft of your primary system(s) failure of part or all of your system(s) and of course malicious software such as extortionware or virus’. Remember electronics like everything else WILL fail. And of course usually when you need it most or expect it least. So please design and USE some sort of plan. I recommend a solution that utilizes technology to it fullest. And for that I recommend backing up you data locally to external/removable hard disk drive(s) (that can and should then be stored in a fire safe or safe deposit box!) along with a combination of some form of ‘cloud’ type of service. I’ll discuss both here. Cloud Storage solutions such as Mozy, Carbonite etc. and other ‘Synchronization’ type of services such as; Dropbox, Box.net, iCloud, SkyDrive and many others offer a wonderful addition to ANY backup plan. And I use many of them and recommend them as an addition or supplemental solution. You can read my previous article here. Bandwidth and storage size – you will be backing your data up to the cloud, and it’s your Internet connection you’ll be using. You need to evaluate your internet connection (and ISP rules and limits regarding that bandwidth – some ISPs severely restrict the amount of data you can use per month! ), and whether or not you need to increase your bandwidth speed and/or allotment. Backup and Restore times – If you are backing up (or synchronizing) a lot of data, how long will it take for the backup and more importantly the ‘restore’ to occur? There are two methods for moving the data back and forth – one is to backup the ‘entire’ file(s) each and every time they are modified. The second is to just synchronize/backup the changed data (called delta or diffing). Will the company be there when you need it?! – Startups sometimes offer amazing prices for cloud storage but require a leap of faith on behalf of users that they’ll still be around next year. It’s possible that even established services could disappear overnight, but more likely the owners will tell you if the service is to terminate, and give you a chance to make other arrangements or retrieve data. Make sure to choose one with a LONG track of ‘being there’. System Resource Usage – Some applications can cause your system to dramatically slow down while others are ‘lighter’ on systems resources and synchronize or back up when you are not using your system or at scheduled times. The best way to find out which works for you is try a few of them. And of Course Security – This is not a small thing. You must make sure your account is protected by a very secure username and password AND that the service you use is very reputable. Also for backup services (vs just the synching type) do they offer ‘full file encryption’? How are your files AND passwords stored on that system – are they themselves encrypted? Are files encrypted before they are sent to the cloud storage provider and are they transmitted via a secure connection (https, sftp etc.)? On a personal note I don’t put ANYTHING in the ‘Cloud’ that contains any truly sensitive information. I simply synchronize documents, photos and other files that I may not really want to have someone access but that I would still not be ‘harmed’ if they were somehow compromised and accessed. For these purposes – easy access to my documents and files from anywhere, and also collaboration with individuals or teams, the cloud reigns supreme; I can place working documents into many locations, access them from just about anywhere and even share them if I need to. I can also restore ‘lost’ or previous versions of documents and files fairly quickly and easily with these ‘cloud services’. Like I’ve mentioned many times previously, I am extremely careful about my personal security so I use cloud services as an ‘adjunct’ to my ‘real’ back/disaster plan. I back up ALL my data using disk imaging. It is the only method that can reproduce, to an exact point in time, your existing system; Operating System, Applications AND files quickly and easily. Usually within less than a couple hours depending on the size of your image(s). With disk imaging (or cloning) I have the ability to be up and running extremely fast. I can restore an entire system or individual files. No need to re-install an operating system and applications and then update them just to be able to access my files. External Hard Disk Drives (and spare internal ones too!) are very inexpensive and getting cheaper all the time! I have written many times previously [read here and here and for Macs here ]about the prudence and wisdom of having backups of your digital data. And by backup I mean that your data exists in TWO places at once and is able to be accessed or recreated from either source quickly and easily. For this I believe the best solution is to use Disk Images for both Windows PC’s and Mac OS X systems. Please read my other articles (linked above) and get and work a backup plan. For my Windows operating systems I use and recommend Acronis and for Apple OS X systems I recommend Carbon Copy Cloner. Both provide a superior solution to those built into either respective OS. OK Mac guys here we go again! There’s Another Mac Trojan Spreading Via Microsoft Office documents and email attachments. The Trojan apparently spreads through infected Office documents, and it’s in “active stage”, which means that it searches through documents on infected machines. Please note that this is a very sophisticated and malicious attack that not only ‘infects’ your machine but also installs a ‘bot’ to control it, scan through your system, and take what ever it wants to! ALL WITHOUT YOUR INTERACTION AFTER THE FIRST INFECTION! The attack vector utilizes several vulnerabilities. The Java whole that Apple finally just fixed last week. And a Microsoft vulnerability that MS patched 3 years ago. (but they may update that patch too). Please folks keep your Operating System, Applications and security software up to date and don’t be one of those poor naive bastards that thinks this cannot happen to you. Author adminPosted on April 16, 2012 December 23, 2012 Categories Apple, OSX, Security, tech tips, Trojan, virusLeave a comment on OK Mac guys here we go again! There is now a simple tool you can use to check to see if you are infected by this Trojan. So far they are finding more and more people with it! The tool is called, appropriately enough, the FlashbackChecker tool. You can get that here. Download and run it and see if you are in the clear. Note that FlashbackChecker can’t actually remove the Trojan, it can only detect it. So, if you or a family member does find it on their machine, you’ll have to go back and run those original terminal commands (from F-Secure’s site) to determine exactly what you need to remove. Mac Trojan is infecting LOADS of people!! OK now the terror starts for you fanboys (and girls). My last article told you of this Mac Trojan. Now it’s apparently infected at least 600,000 users so far (read here) and it’s terrifying everyone! It’s written in an unknown language, doesn’t even need your password to compromise you! Please read and take precautions. It’s written in an unknown language, and doesn’t even need your password to compromise you, and. For instructions on how to check for and how to remove it you can AND SHOULD go here. This is F-Secure’s site. NO system that is connected to a network is EVER safe. It can only be made more secure. Don’t ever think you Operating System is your security; it’s not – YOU ARE! Be safe out there people! A new Mac Trojan that can now infect your computer from little more than a visit to a website AND requires NO PASSWORD TO INSTALL is making it’s rounds and promises some scary things! The exploit was patched in February for MS Windows systems, however Apple has yet to release one for OSX. F-Secure has a method for checking for and removing the infection here. So once again folks please do not be naive and think you are immune to attack simply because your Operating System is not MS Windows. The information contained in this website is for general information purposes only. The information is provided by the authors and while we endeavour to keep the information up to date and correct, we make no representations or warranties of any kind, express or implied, about the completeness, accuracy, reliability, suitability or availability with respect to the website or the information, products, services, or related graphics contained on the website for any purpose. Any reliance you place on such information is therefore strictly at your own risk. In no event will we be liable for any loss or damage including without limitation, indirect or consequential loss or damage, or any loss or damage whatsoever arising from loss of data or profits arising out of, or in connection with, the use of this website. Throughout this website you are able to link to other websites which are not under the control of the authors. We have no control over the nature, content and availability of those sites. The inclusion of any links does not necessarily imply a recommendation or endorse the views expressed within them.